As I said in my last post (About Arbutus) it was my girlfriends birthday recently and as well as going to Arbutus we also went to the London Zoo. I thought it would be fun. The entry I thought was quite expensive but hopefully it is going to improve the lives of the animals! My girlfriends favourite animal at a zoo are the giraffes so we went to see them first. The giraffes are in the Africa zone. There were 3 giraffes and to me they looked very sad and bald (It may just be a giraffes face) but I kind of felt sorry for them. They were just standing there doing nothing and looking bald. I also felt sorry for them due to the weather. I doubt giraffes are built for UK cold weather (and it was very cold). 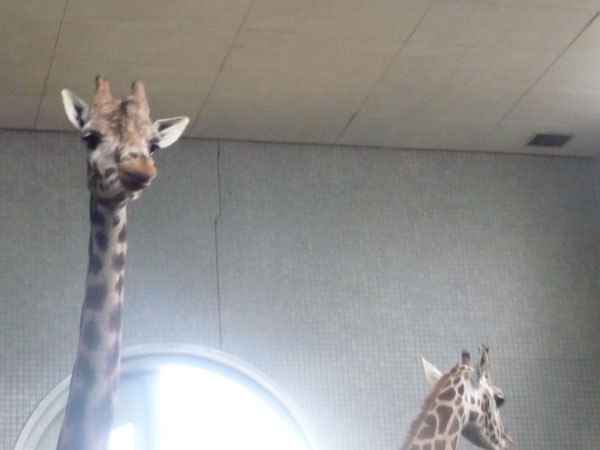 Should I feel sorry for the giraffes or are there lives improved at the zoo? Answers on a post card please. Then we looked at zebras and hunting dogs and tried to look at other animals such as Warthogs (but they weren’t there) in the Africa area. One problem with zoos is half of the animals aren’t there. Discounts should be given on how many animals there are at a zoo! Afterwards we went to the Natural rain forest area and watched some monkeys. This was my favourite area. Monkeys are one of my favourite animals. They looked like they were having more fun because they have space to swing about and live life more. Inside this forrest area there was the coolest monkey (now my favourite animal) in there which is called a Taramin monkey. They are awesome. They have moustaches! 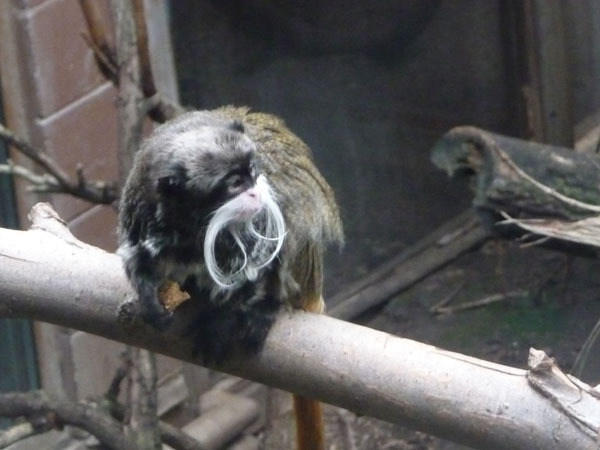 Monkeys with moustaches! Can you get better than that? I think not! If you think you can, prove it! It was awesome. They were swinging about, eating food, hanging upside down. They were great! Also in the Natural rain forest zone were rats (less interesting), creepy crawlies and bats (that were frantically flying around). Next we did the reptiles and amphibians zone. I have to admit I love turtles and tortoises. I have no idea why but they are so cool. In Hong Kong you could buy a turtle as a pet and if I could somehow get it back to the UK , I would have! Is that cruel? Anyway turtles and tortoises are awesome! The rest of the reptiles area was more ‘spot the reptile’ as those crafty snakes are good at hiding! I have little interest in snakes if I was being honest. The final zone we went to was the gorilla and cat zone (odd combination but I can’t think of the actual name). The gorilla was doing nothing as it was too cold outside and cats like lions never do anything. A mass crowd ran over to the lion to see it move 5 steps. I’m sorry if I offend any lion lovers but lions are quite dull and they don’t do a lot. We then left via the penguins and meerkats. It was a fun day out just walking and talking with my girlfriend looking at the odd animal when it was there! The recipe in todays post is based on the restaurant Murano. A few posts ago I talked about the amazing dessert I had (Chocolate ganache, crumble, Passion fruit Sorbet, Mint). 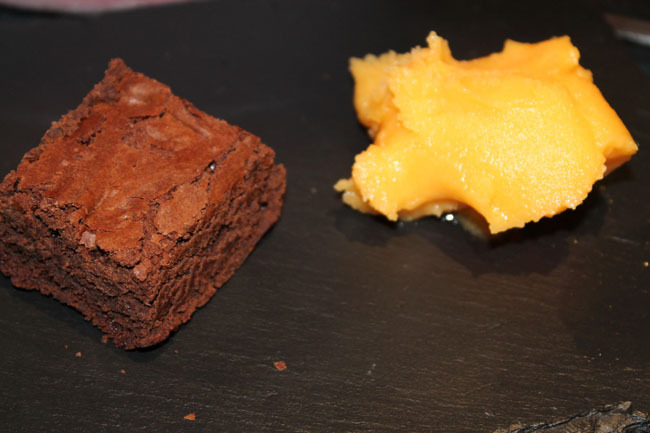 Well I recreated a simpler version below of Chocolate brownie with passion fruit sorbet and was so so so so good! It was awesome and another Dessert to add to FADHoppers! (rare). Sorry for the presentation. – I haven’t mastered quinelles yet. Melt on a low heat until it is smooth. Place the water and sugar into a pot and bring to the boil. Simmer for 5-10 minutes, until the mixture forms a thin syrup. Add and stir in the lemon juice. Allow to mixture to cool slightly for 5 – 10 mins. Churn in an ice cream machine, according to the manufacturer’s instructions.